is the theme for this month at FSC. and got out my sewing machine! Those that know me, know that I don’t sew. because I can’t remember how many years it has been since I last used it. Usually I have to sit and read the instructions each time, so it kind of puts me off using it…but this time I actually did it! I am guessing that the machine will stay out for awhile and you will see some more “embellishments” of the crafty kind for a little while. My favourite thing on this is the little leaves. and coloured over the inking to give them some extra colour and a more autumnal look. For my make I have used Distress Paint as my resist element. 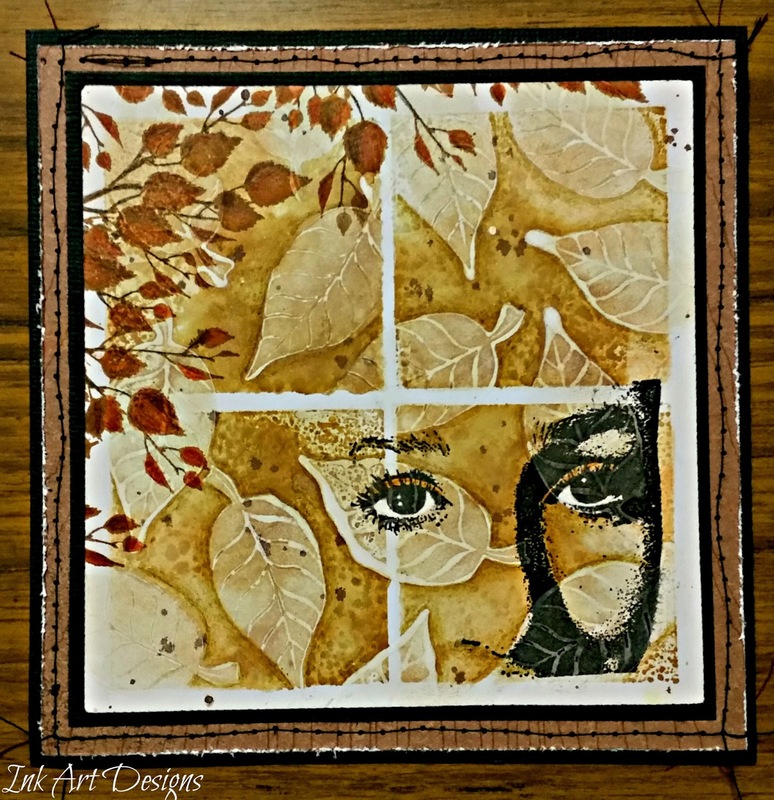 The leaves were a silhouette which is ideal for this method. The eye landing on a leaf was sheer luck…but I like how it looks. The background is done using an acrylic block. And highlights where added here and there with Inktense pencils. Way to go Dot! Brilliant and clever card – love the eyes and the sewing finishes it superbly! (Back in the UK today so back to my craft cave in a few days!). Stunning card Dot, the eye looks amazing – happy accident! Love the autumnal colours and rustic stitching. Wowww Dot, the card is fantastic in the autumnal colours and i love the stitching. A great design! Utterly lovely – a really hauntingly beautiful card, Dot. The colours are stunning, and I love the distressed stitching – hope we'll see lots more now the sewing machine is out!